You can associate content with your pages using a free-form text editor. For example, you can create detailed descriptions about your designs, or paste existing specifications or requirements from clients. You can then create a project-wide specification document by exporting this information to a Microsoft Word file. 2. Select the page of interest. 3. Open the text editor. 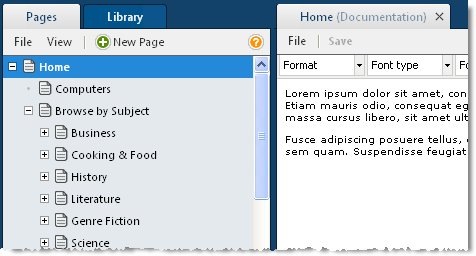 Open the text editor by selecting Open Documentation from the File menu or from the right-click context menu, or by using the keyboard shortcut. The text editor opens in a separate tab in the wireframe Editor. Use the text editor toolbar for simple formatting. Use the HTML Source Editor to specify any HTML or inline styles. You can also paste text from Word or other text editors. The documentation tab for the Home page is shown below.